The German colonies in Africa were conquered with much blood and anguish and from what I've come to understand they never actually paid for themselves. Well, and they lost them along with everything else after World War I. 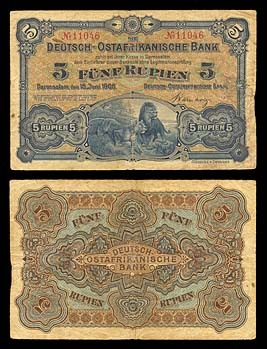 The German East Africa notes are quite popular in Germany and elsewhere. I believe that this is because they are scarce but not impossible to find. The situation is different with the relics of German Southwest Africa, any of which are impossibly rare and unpleasantly expensive in even the worst possible state of preservation.